ROCHE BOBOIS PARIS CAPE TOWN. 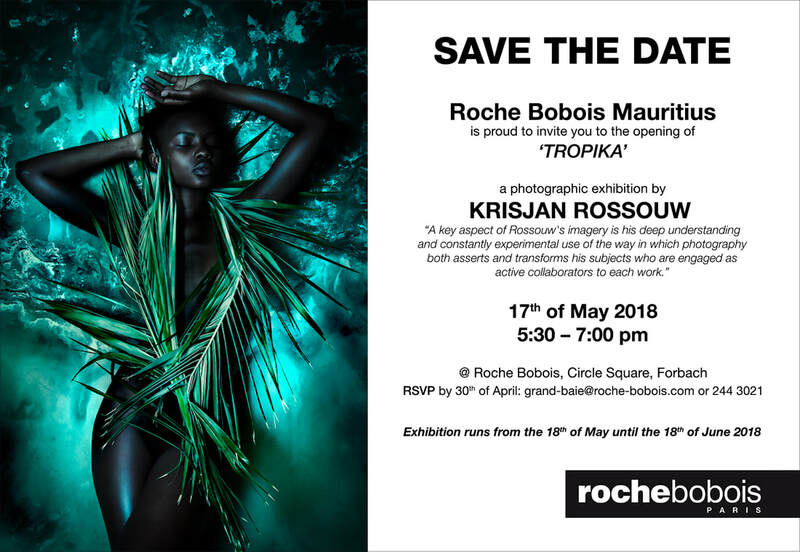 Roche Bobois Cape Town hosted the official opening for the exhibition of Fine Art Photographer, Krisjan Rossouw, in partnership with The Boutique Gallery on Thursday, 23rd February 2017 at their showroom in Cape Town's Kloof Street. The first of its kind. 140 VIP guests were invited to walk around the Roche Bobois showroom on Kloof Sreet and observe his amazing photography and appreciate the story behind his work, all while enjoying a selection of heavenly pastries from Cedric French Pastry and the delicious Dorrance wines. Krisjan’s work will remain on the showroom’s walls until the 13th of March to give people the opportunity to come back and have another look if they haven’t already done so. It is also possible to organise a private tour with the artist if requested within the time of the exhibition. The exhibition is open for all to view the works any time during the opening hours of Roche Bobois’ Kloof Street showroom from the 23rd of February to the 30th of March 2017. Thank you to Tom Page for the wonderful interview and all the publicity. Thanks to the fantastic team of Mango airlines for my wonderful full page write up on my current exhibition at The gallery, Knysna Fine Arts. opening on Saturday, 25 April 2015, at 17h00 until Sunday, 31 May 2015. The Exhibition Launch was a magical evening filled with models from around the globe. Guests were encouraged to kick their shoes off and enjoy Krisjan's ocean inspired photography barefoot in sea sand. Electric classical mixes was once again created by sound master Dino Moran and endless amount of wine by Grande Provence. The Walls are filled with beautifully curated displays, like this one featuring locally made design products and a beautiful artwork by Krisjan Rossouw. The attractive charcoal facade of the Haas building in Buitenkant Street. Old world charm meets contemporary flamboyance in the interior decor. Justine created the display apartment featuring art works of Krisjan Rossouw's Dark Paradise series in the newly opened Locarno precinct at Harold Park by Mirvac alongside a future park ,forming part of a continuous 20 hectare corridor leading to Sydney Harbour foreshore. at The Castle of Good Hope, Cape Town South Africa. Electric midnight paradise soundscapes created by Dino Moran and wine from D'Aria Winery. Artists to make note of Krisjan Rossouw, Mary Sibandes, Cameron Platter ,exhibitions to diaries and galleries to visit. Krisjan Rossouw's 1st international solo Exhibition was held at The Box Gallery on the evening of the 15th December 2013. At the recent art fair held in Cape Town waterfront the great team of Ebony francchoek sold 4 of the 6 Krisjan Rossouw art pieces. EBONY is a fine art gallery and exclusive design space with branches in Cape Town and Franschhoek. The Gallery showcase the best in contemporary South African art, furniture design and home accessories. This block of Dutch and Georgian buildings was probably the closest thing Capetonians had to a mall back in the 18th century - gunsmiths, bakers and cigarette makers all conducted their businesses from here. The historical site was set to make way for a multi-storey car park, but luckily fate was on its side, and in the 1980s it was given a new lease of life, becoming the largest private conservation project ever seen in the city. Miraculously, the country's oldest vine, dating from 1781, made it through all the constructions in one piece, and can still be spotted in the courtyard today. When owners, creative couple Deon Redman and Krisjan Rossouw, laid eyes on it. In search of a renovation project, they were amazed to come across the house – then a pokey single-storey dwelling that was used for storage. ‘It was the only run-down wreck in the cutest street,’ says Krisjan, a photographer. It was ripe for a complete overhaul.